This week, Beverly and I are traveling to Singapore on a house-hunting and exploratory trip. During the week, I’m going to be documenting our trip in small bursts and stream-of-thought posts. I’ll place these posts under the tag “house hunting” if you want the full digest. Four days of house hunting. It should have been two, but Jeremy, our agent, found some places to check out for some additional options. One of those places was in a neighborhood called River Valley, along the Singapore River, near Orchard Road. We loved the river walk and promenade so much, we asked Jeremy if he could show us around one final day for more places. We have been zeroing in on a single property – pictures forthcoming – but have been hesitant to pull the trigger. This complex is in the Holland Village neighborhood, a sort of bohemian neighborhood with many shops, both local and boutique, but central to the island and close to what the locals refer to as “The City”, the downtown area. Singapore is a city with so many hidden enclaves, we felt that we’d be doing a disservice by not being as through as we could. So, with that in mind, we set out to explore with our agent one last part of town. We found that what we could afford just had too many issues. There is a lot of construction going on in that area, or that the places were small and had no amenities, or were just old and run-down. By the time we sat by the pool at the final place we looked at, we finally expressed our desire to move to the location on Holland Hill. Then we walked into the final apartment we would see. This place had some problems – the location was a great residential neighborhood called Mt. Sinai, but without the easy walkability of Holland Village. The complex was nice, but inclosed on itself and with some odd choices for amenities. The unit faced west, the final resting place for the brutal afternoon sun, but to the west was a breathtaking patio with our own private garden near the master bedroom. The place had space, a private patio that never got direct sunlight, and an open kitchen that faces the open patio. The choice just got a bit more challenging. Jeremy drove us over the east side, to the beach, where he took us to Jumbo Seafood, a beach-front staple and home to a great rendition of a Singaporean classic – chili crab; steamed crab cooked in a sweet chili sauce which has become the unofficial official food of the island. Also sampled, drunken prawns so juicy that their little legs squirted while being de-shelled, pork and chicken satay which many in the US recognize as a Thai dish but is rather Malay in origin, and otah, a fish cake baked within a banana leaf. I am pleased to announce, and with some difficulty of movement around the mid-section, that Singaporean food culture lives up to its reputation. I should have no issue falling asleep tonight, or on the plane ride tomorrow. Food was the source of a sense of accomplishment for lunch – Beverly and I walked around Gardens by the Bay, a collection of trees and plants from around the world to demonstrate the power of biodiversity and of course, make oodles of money off some trees. It is a treasure, through and through, where one can walk from Chinese to Indian to Malay gardens through winding, shaded pathways. However, today was beastly hot, and no amount of shade could prevent us from hiding back in the hotel to re-hydrate and prep ourselves for another day of house hunting. 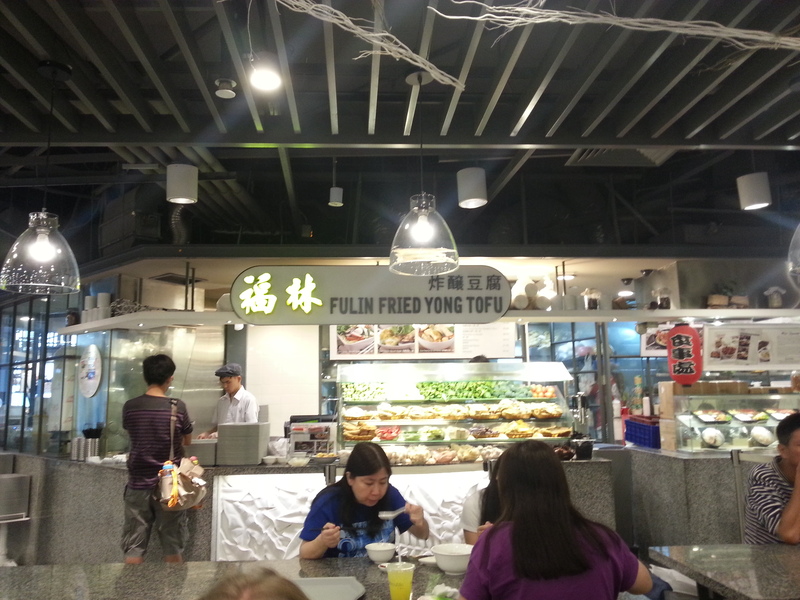 A food cart stall in Suntec City’s Food Republic court. However, this left us with little time to eat. We could have eaten in the hotel, but trusting memory and advice from our wonderful guide, Nellie, we went into nearby Suntec City Mall to their food court. Mall food courts here are not what an American would expect. We might think of endless rolls of grease from Sbarro or Panda Express, or the bland whatever-that-is of Subway. Not so within Singapore, as we’ve found. 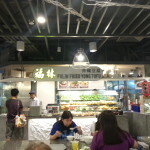 However, we were guided to our first foray into mall cuisine, Nellie having pointed out her favorite Indian food in the basement of Tanglin Mall. Here, we strode boldly, into a court called Food Republic, where patience led us past the over-priced noodle house at the entrance, and into a series of hawker stalls. Beverly had soup that she loaded with tofu and fish balls and mushrooms, I found Korean beef which was seasoned with kimchi and dried baby anchovies. It was simply put, incredible food, and best of all, cheap, and we left to meet Jeremy with full stomachs and hearts, filled with accomplishment. This town knows how to throw a party. Chinese New Year is winding down, but the city is still in party mode. Two nights of lighted floats have paraded down Raffles Ave, and tonight’s celebration is complete with a fireworks show and screaming multitudes, celebrating the new year and being alive. The next month cannot come quick enough, and yet, I know that so much work awaits us back in Rose City.